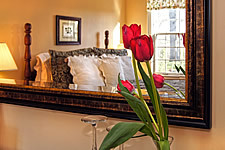 One of the original bedrooms in the house, Dogwood Room is our coziest room. The view out of the windows includes our fishpond where the goldfish will keep you entertained as will the birds and squirrels at the birdfeeders. 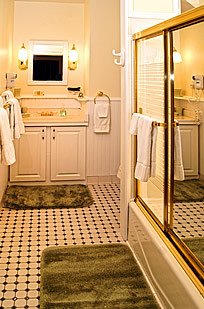 There are more than 40 dogwood trees on our property – some of which can be seen from this room. If you come in the spring, you will be delighted by all the blossoms. Celebrating a special day or event? How about adding an extra special touch, such as a beautiful bouquet of flowers and a bottle of wine and wine glasses? Check our Extra Touches page for more ideas, or make it a complete package – see our Packages and Specials page. Rate: $190-235 includes a three-course breakfast each morning. Rates vary depending on the day of week and time of year. Check the actual rate by clicking Check Availability and selecting the date of your intended stay.